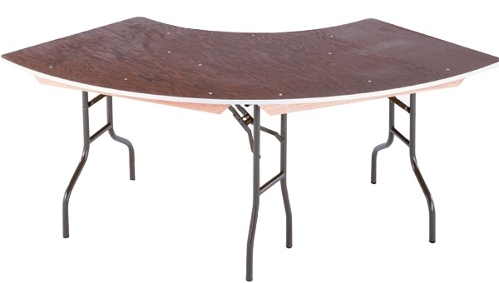 This 60" serpentine table has a 3/4" plywood top, black legs, and aluminum edge. A serpentine table is required for more elaborate banquet room designs. Four of these tables create a 60" circle in the middle of them. Use these tables for unique buffet designs, display, and much more! Creates 60" Inner Diameter when 4 are used.